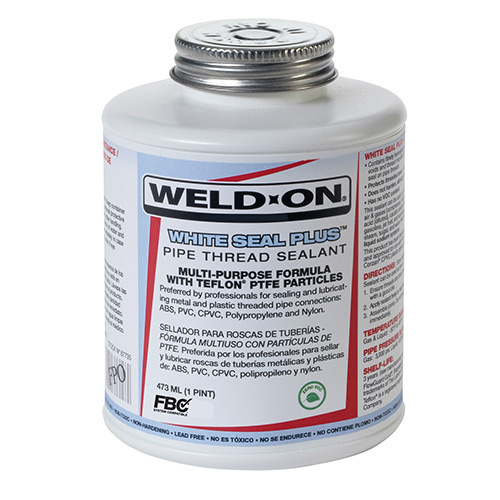 Contains finely homogenized PTFE particles for filling cracks and thread imperfections – ensuring a leak-proof seal. For sealing and lubricating all metal and plastic (ABS, PVC, CPVC, Polypropylene, & Nylon) piping systems carrying various materials. This product has been tested, and is monitored on an ongoing basis, to assure its chemical compatibility with FlowGuard Gold®, BlazeMaster® and Corzan® pipe and fittings. FBC™, FlowGuard Gold®, BlazeMaster® and Corzan® are licensed trademarks of The Lubrizol Corporation or its affiliates.